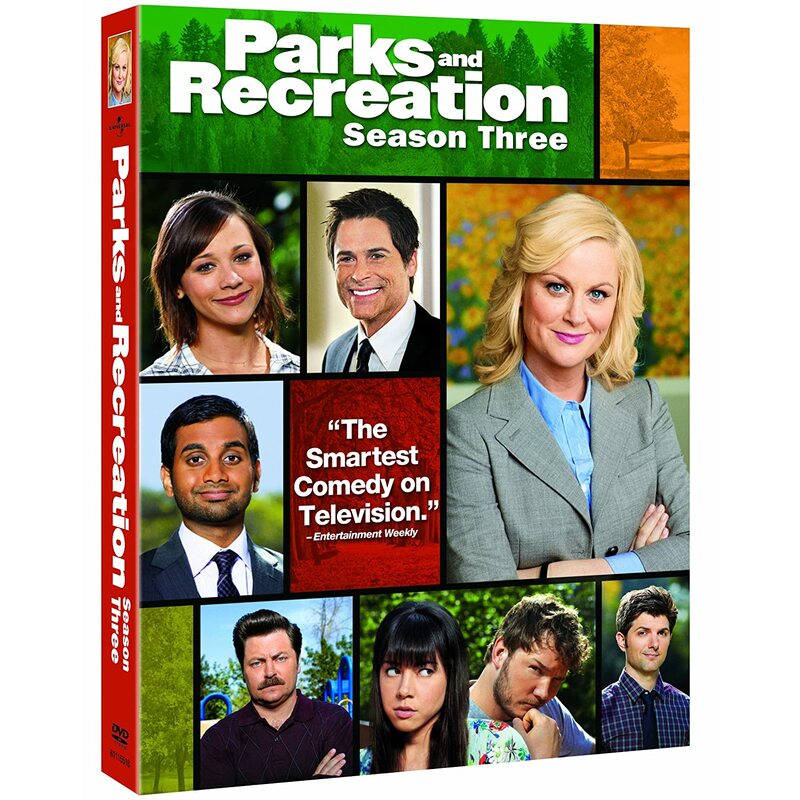 Quick Take: Parks and Recreation, "Media Blitz"
Review: Parks and Recreation, "Media Blitz"
(S0305) If you doubted Adam Scott's addition to the Parks and Recreation cast (and you shouldn't have because he was awesome on Party Down and the only funny part of Step Brothers), then your fears should have been averted tonight. His Ben Wyatt character has been playing the straight-man role for most of his existence (though a very strong straight-man), but we saw brief visions of his awkwardness in last week's excellent "Ron & Tammy: Part Two" with his interactions with the Pawnee chief of police. That awkwardness hit a whole new plateau in "Media Blitz." The upcoming Harvest Festival (which is apparently only two weeks away) isn't getting the attention the Parks Department needs it to, so Leslie (Amy Poehler), Tom (Aziz Ansari), and Ben (Scott) decide to meet with the four biggest media outlets in Pawnee. First up is the "funniest" drive-time radio show, "Crazy Ira and the Douche," played respectively by underrated comedic actor Matt Besser and overrated comedic actor Nick Kroll. A barrage of terrible fart jokes eventually lead to the hosts confronting Ben about his tenure as the 18-year old mayor of Partridge, Minnesota, which causes Ben to clam up and not emote any confidence regarding the Harvest Festival budget. While Leslie moves on to try and fix the situation with recurring reporter Shauna Malwae-Tweep, Ben and Tom go on Perd Hapley's morning talk show, "Ya Herd with Perd." Man, I love how Perd Hapley starts segments, questiions, etc. with phrases like, "The story of this question is..." What an awesomely weird character trait. But the lovable Perd is unable to put Ben at ease, who takes his awkwardness to a disturbing level. The final stop is, of course, Pawnee Today with Joan Callamezzo, who, according to Leslie, "runs this town." Leslie has Ben sit on the sidelines while she handles Joan's rapid-fire questioning. But when Joan brings the subject back to Ben's past troubles, Leslie brings Ben on camera to try and promote all of the great things he's done to help town budgets since his mayoral disaster. And after a brief stumble, he actually kind of does it. You'd be hard pressed to ever call Ben a captivating interviewee, but he's good enough for one brief moment. As Leslie, Ben, and Tom tramp around town, April (Aubrey Ludgate) accepts Chris' (Rob Lowe) offer to work for him in Indianapolis. Andy (Chris Pratt) offers to perform all of the tedious daily tasks that she hates in order to convince her to stay in Pawnee. She accepts, even though she has no intention of staying. Some of her hated tasks include managing a permit desk, picking up her sister, and giving foot massages to Donna and Jerry (though those last two were as favors from April). Ron (Nick Offerman) has taken an unofficial mentorship to Andy and doesn't like to see him strung along in such a way and tells April just that. Having her own fatherly relationship with Ron, April takes what he says to heart and finally kisses Andy again. Say it with me now: awwwwwwwwwwwwww. The other main relationship on the show, Chris and Ann's (Rashida Jones), has become even more serious, even as the lingering fact remains that Chris is leaving for Indianapolis soon. Ann becomes somewhat jealous that Chris offered April a chance to accompany him, even if it's in the business sense, but becomes even more frustrated when Chris never even acknowledges their situation. Finally, she comes forward with her issues and he agrees that they need to talk about it. And they do. But what was the result?! Stay tuned (I guess). All in all, another great episode that expanded on a character I've been excited to get more insight into: Ben Wyatt. It seems pretty safe to say, that with the mutual attraction between him and Leslie, he probably won't be returning to Indianapolis himself. I wasn't able to take notes during this episode, so it's hard to remember quotes verbatim, but I love how Shauna Malwae-Tweep (it seems awkward to not use her full name) has all but accepted that she has to sit through's Leslie's oddly enduring headline writing before she can get to her actual interview. And that's it. That's all my lingering thoughts. A show that brings us "Crazy Ira and the Douche" is enough to have me firing up the DVR. But on a more serious level -- and I'm not the first person to say this -- the fact that P&R is now operating on a Simpsons-like level where recurring bit players and characters are inhabiting Pawnee, fleshing out an already great comedy to create a unique world that we enjoy spending time in.